Gotham was turned upside down at the start of the season, and Jim was forced to take up a post in Arkham asylum after trying to take down the corrupt mayor. Harvey is sitting in his desk alone. Barbara is still with Montoya, strung out on pills. During a stage production at Arkham, an inmate attacks another. It's the fourth attack since Gordon's taken up residency. Gordon is being blamed, and he points out that the man needs help, not medication. The nurse doesn't have any training to treat, only to provide drugs to the inmates. The Director warns Gordon should there be another incident then he'll be placed on the remedial roster. He takes the patient to see a doctor to check out his injuries. Dr. Leslie Tompkins finds that the patient is fine. She normally works in the women's ward, and tells him that the ladies are quite taken with the handsome Gordon. He's the talk of the place, the prestigious cop brought down by the corrupt system. Cat finds a sick Ivy sleeping in a cold wet box, but she doesn't want to see a doctor. Cat takes Ivy with her to get help. Cat sneaks into Gordon and Barbara's home. They haven't been there for some time, Cat smell dust and rotten food, but its warm and dry. The Penguin heads over to the waterfront. He's looking to get a pay off, claiming to collect it on the behalf of his boss and throwing out the “don't you know who I am?” but the man isn't willing to pay the higher rates. Penguin thinks that he owns the cops, but a blow to the jaw may say otherwise. Gordon goes to check on the aggressor in the fight incident, and finds the man staring off without blinking. He gives him a small hit to the shoulder to get his attention, and Jones just falls over. Thompson finds that Jones has been given some intense electoshock therapy. His brain is mush. The Director blames Gordon, but again Gordon points out the logic of the situation. They're in a place with no surveillance, and they're understaffed. Gordon thinks that they should call in the GCPD, but the Director refuses. Jones is still alive, and so they can still count him among their inmates. The Director gives him until the end of the week to find out which inmate did it. Thompson tells him what it would take to do the sort of damage done. The big missing piece is keys to the cell. Gordon goes and confronts the most likely suspect with access, another guard. The man squirms a bit, but finally admits that he lost his keys, and had to find another set, but he doesn't know where the keys went or who had them. Fish and Butch sit down with some other men, who are less than pleased with Falcone. They're not happy that Falcone is raising prices since his own money blew up. Fish asks who they think should take over should Falcone meet his maker. They're going for seniority, but Fish thinks that they need some fresh ideas, ideas that she has, and that she'd be perfect to run the family. Gordon interviews some of the inmates to see who killed the frog man, Jones and took the keys. He gets many different reactions from the inmates, and none of them helpful. Cat looks out over the rooftop, down at the city. Fish sizes up the others. Saviano is the problem Fish knows, but Butch tells her to let him talk to him first. He knows he can get him to change his mind. Fish questions Butch's loyalty, but he remains adamant that he's on her side. The electricity surges again, and another inmate is shocked. Gordon hears him rattling a fence, and sees the tell tale marks of a shock delivered, mushing the brain. Gordon takes Royston to see Thompson. Royston can only remember the lines to his play, and nothing more. Thompson finds that the shock wasn't so drastic, either the technique is improving or they can't control the device. Gordon thinks she should stay away for awhile, that things are about to get hairy. The missing keys made him think that the inmates were to blame, but he's having a change of heart and thinks it may be a staff member. Thompson asks what makes him think it isn't her, he doesn't think she's the type to do it. There's something odd about her groupie adoration of Gordon, she's certainly got plenty of kooky to have done it. Gordon takes his theory to the Director, but he doens't think its a theory that should be investigated. What's with this guy? Is he the most incompetent Director ever, or Sparky himself? Why is he so scared of the police. The Director tells him that he's not authorized to investigate the staff only the inmate, and accuses Gordon of trying to force his hand and call the police, but Gordon has already called them. Montoya rouses the sleeping Barbara. She wakes up all smiles. Montoya asks if she's spoken to Gordon lately, and Barbara claims that she has nothing to worry about, that she's over Gordon. Montoya realizes her mistake as Barbara kisses her. She realizes that them being back together was a mistake, she should have never let it go on too long. Montoya sees that they're toxic together, the drinking and the drugs, everything. She can't help her, and she can't let Barbara derail her own recovery. Barbara tries to gather her things, but Montoya offers to leave instead. She sees that Gordon was good for Barbara, that he helped her in ways that she never could. Harvey gets a good look at Jones and Royston. Jones is staring off into the distance, and Royston is spouting Shakespeare. Harvey is overjoyed to see Gordon, and Arkham lived up to the freaky hype he tells him. Director Lang tries to side step, telling Harvey that no one of authority called him and he shouldn't be there. Harvey tells him that its third degree assault at the least. Director Lang warns Gordon that its the end of his career, but Harvey questions if Lang was involved. He should desire to keep it quiet, especially if he were the one who did the crime, since he had the skill. Harvey takes him down to the precinct, while he tells Gordon to search the staff records. Butch meets up with Saviano. They go way back. It seems that Saviano wanted the meeting as much as Butch did. Butch tells him that what Fish said was true. Gotham is changing. Saviano tells him that Fish is a sinking ship, and without him and his men, she would be nothing. Saviano offers Butch a pretty nice welcome package to ditch Fish and come over to his team. Butch doesn't accept or turn it down, but asks to think about it. Penguin sits in his cell as Harvey arrives with Lang. Penguin is glad to see him. He tells Harvey that there has been some silly mistake, and begs him to let him call Maroni. Harvey likes having Penguin in the cell, that its soothing like a bonzai tree. Fish's club is hopping. She asks Butch for an update. He tells her that he did see Saviano, and that he's working it. He asks for more time to get Saviano to their way of thinking, and Fish is willing to give him that time. Harvey asks Director Lang what Electroshock therapy is suppose to actually do when its applied correctly. When delivered by the proper people it can alter personalities for the better, but it wasn't delivered by a skilled surgeon, there isn't one on staff besides Lang. Harvey tries to probe into Lang's concern over police involvement. He's got plenty of skeletons, but insists that they have nothing to do with the case. Gordon is having no luck with the files. He's sure that there are files elsewhere, in the basement, but the nurse insists that no one has been down there in years due to toxic chemicals. Gordon asks her to take him down there. Harvey continues to question the Director, but he insists that everyone there are good people that have been there for years, but one female does pop to his mind. Gordon and the slightly off nurse head down to the basement, when they hear a noise. Its Dr. Thompson. She's surprised to see Dorothy, who tells her that they're going on an adventure to the basement. Thompson asks if she can come with them, but Gordon tells her no, that she should leave. Dorothy grabs Thompson, and shoves her towards Gordon and the stairs as she makes a run for it. Gordon tells Thompson to have the facility locked down. Harvey calls Gordon to warn him about Dorothy, but he already knows that she's not really a nurse, but an inmate. Dorothy opens up all the doors, and lets the inmates go. Thompson finds herself of the run as the inmates come charging after her. Dorothy calls in the rush and is crushed to death. Thompson finds herself at a dead end, but luckily runs into Gordon. She struggles with a fence, while he throws a few punches. He orders the inmates back to their cells, and for a minute they look like they're considering listening. Thompson gets the gate open, and slips through, which riles them back up. Gordon slips through as well, and together they lock the gate. Ivy reminds Cat that she's a vegan as she sits in front of the fire. Barbara calls home and Ivy answers. She asks if Gordon is home, and Ivy tells her that he's busy at the moment. Barbara asks who she is and Ivy tells her that she's a friend of Jim's, implying more. Barbara throws her phone in a fit. Harvey and Gordon deliver their findings to the Captain. Dorothy was an inmate, who killed kids with poisonous candy as a nursing student. She spent half of her life at Arkham. When it was closed down it looked like she hunkered down in the basement, and it seemed that she was trying to find a cure for her own madness. The Captain sees the closed case as a win. Everyone wants Gordon back, but the Captain can't bring him back yet. She offers him a drink for old time sake, and she's digging his new uniform. He does look pretty great in it. Maroni pays Penguin a visit. Penguin's ecstatic to see him, but Maroni isn't so pleased. Penguin is looking pretty retched. Maroni points out that he's in the pen because he put him in there. He asks if he knows what hubris is, Penguin has overstepped more than a little in Maroni's eyes. He's no longer the favored pet. Penguin apologizes, vowing to never overstep again, and Maroni accepts. He tells the detective to let his friends out, and detective complies. 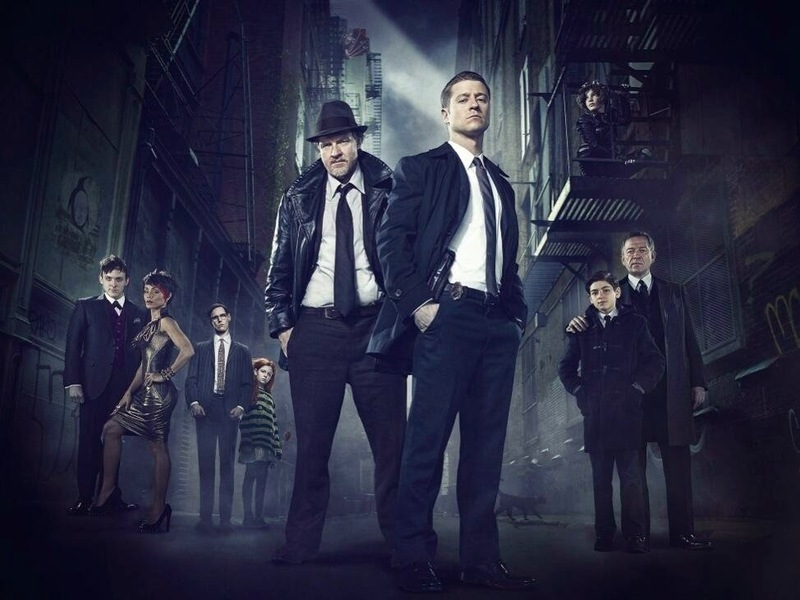 Penguin stinks, and Maroni wants the lesson to stand as a reminder. A ME comes in with photos of Dorothy Duncan's body, and has some bad news for the trio celebrating. Dorothy had the same electroshock marks as the others. Hers were old and hid by her hair. She has a victim herself. Harvey tosses back his drink as Gordon puts it together that Dorothy couldn't have did it to herself. They rush back to Arkham. An inmate unlocks the gate. Sweet Aaron, isn't so sweet as he grabs the guard and snaps his neck. Gordon had seen the psychotic nature of Jack Gruber, writer of the play that went array, and he was right. Gruber was behind the whole thing, and Aaron was another of his victims, one that worked out much better than the others. Director Lang sees the pair and realizes that he just stepped into the frying pan. Gordon and Harvey arrive too late. Lang is down. He sputters a few words, but dies all the same. Gordon finds a note in Lang's hand from Gruber. It gives him all the details that he needed. Gruber admits that he was working to perfect his technique, that Dorothy worked well, but Aaron better. Gruber drives out of Gotham. Gordon returns home. He can tell someone has been there, the girls haven't exactly picked up after themselves. He calls out to Barbara, hoping that it was her, but gets no answer. Butch sits by the Waterfront. Saviano pulls up next to him, and Butch gets into his car. Saviano tells him that he's good, and Butch tells him that he's in. Butch asks if he remembers when they were 14. He admits that when they were kids he cheated him out of the good cuts. Saviano tells him to forget about it, but Butch insists that brothers don't do that to each other. Saviano thanks him, and Butch thanks him for his forgiveness and shoots him in the head. Butch drives away as if nothing happened. Fish should really reward his loyalty, he's proven himself above and beyond.